Organigram - Netherlands - Office International. The garden site is situated in a high tech business park. Smaller office buildings seem to be part of the garden site. 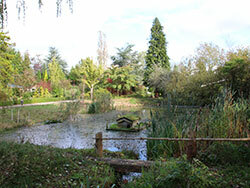 The site has several demonstration gardens, for example for composting, sheep, insects, birds and a Food Bank garden. The garden site is part of the urban green structure because of biodiversity. 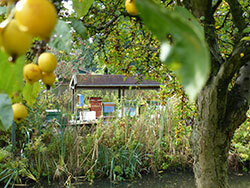 It is one of the oldest associations in The Netherlands as has some very remarkable garden houses. 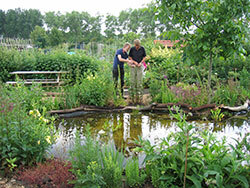 The site is in the highest category of the National Quality Mark for Ecological Gardening. 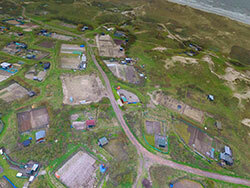 An allotment site with many special elements for recreational co-use. 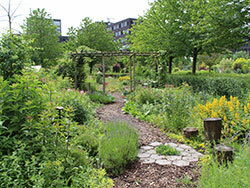 The garden was one of the first in The Netherlands to receive the National Quality Mark for Ecological Gardening. Too special not to mention as the dune gardens exist for about 150 years. The gardens are situated with the dunes of Egmond aan Zee and are part of a unique and protected sea village landscape. In 2017 the association celebrated 100 years of vegetable gardening on the site, unique in a dense populated country like The Netherlands. The site is in the highest category of the National Quality Mark for Ecological Gardening, has gardens for children, a herb garden and a beautiful ecological pond.